First time ko naramdaman mangarag na katulad ng kahapon. As in low batt na, binibilad pa sa araw para lang magka-power ulit. Pero, as always, soooobrang saya. Aside from needing the kicks of a physical activity, this is also one way of exposing myself to the realities of everyday danger. Nakanampucha... aksyon star na aksyon star ang dating. Ano nga bang chechebureche ang nginangawa ng bunganga ko ngayon? Same place... Last Castle, Kapitolyo, Pasig in front of the former Ultra Sports Complex. We arrived at the site by 11:00am and before we leaved at around 6:30pm, mga naka seven games na yata ako na non-stop... not even for lunch. Mistake number one. I will also have to bring my own waterjug next time. A big one. Mistake number two. We've been short on pictures too because I wasn't able to bring extra batteries for my digicam. Mistake number three. I've stared too long to that girl in urban camouflage. Now, she's keep on peppering bullets in my mind. Haaay, ang cute. Hope to see her next gunbang session. Mistake number four. Hehe. Anyway, my HK G3A3 is operational once again... thanks to Papa Willie! The findings was that last Sunday, I kept on triggering the gun even when it was not releasing BB bullets anymore. That fried the motor and the battery lines. They were able to fix it now but I need to buy my own battery pack soon. Regarding my games, as I said, it was fun. Most of my skirmishes was operated as part of a three or sometimes two-man sniper squad with John Liit as the designated sniper and me as either the advance lookout to check for good sniping locations or the close quarter fire suppport if in case the sniper's position was compromised. I got another kill this time. The kill-ratio doesn't matter much though but how you played as part of the team. Still, it's just annoying how players will not accede to a hit just because they are "kill-hungry". Ang kukunat!! That's why you can't blame us when our guns are all high-powered and all. Kung ayaw umamin... saktan!!! Bwahahahaha. "Zombies only die when shot in the head" sabi nga. "Zombies" kasi term nila sa mga makakapal ang mga mukhang hindi umaamin pag tinamaan e... kasi they keep on coming back from the dead. I mean c'mon, the sport's a gentleman's game... kung magkukunat lang din sila in able to hoard kills e mag Counter Strike na lang sila. I never thought zombies were really that annoying kasi until yesterday when I experienced encountering several of them myself. E di binaril ko... ratrat na. Dalwa pa sila. Kitang kita ko tinatamaan sila, I even heard lumagitik yung face mask nung isa. Hindi pa umamin! Tapos nag return fire... tinamaan ako. Ako na lang ang umamin. Demmit! Next time let's involve Peptalk on the game for these bastards! Peptalk is the Shakk's lovely baseball bat by the way. baket di ka na lang nagsundalo kc, di sana kasama ka ngayon sa kalokohan ng mga kano! sergeant garrik: nyahaha.. uu nga no. mines not "red" either... pero pulanggulaman lumabas sa isip ko. nyahahaha. private lica: uhmm medyo mainit actually. pero in the thick of the games it doesnt matter anymore. lalo na pag enjoy ka na. hehe. 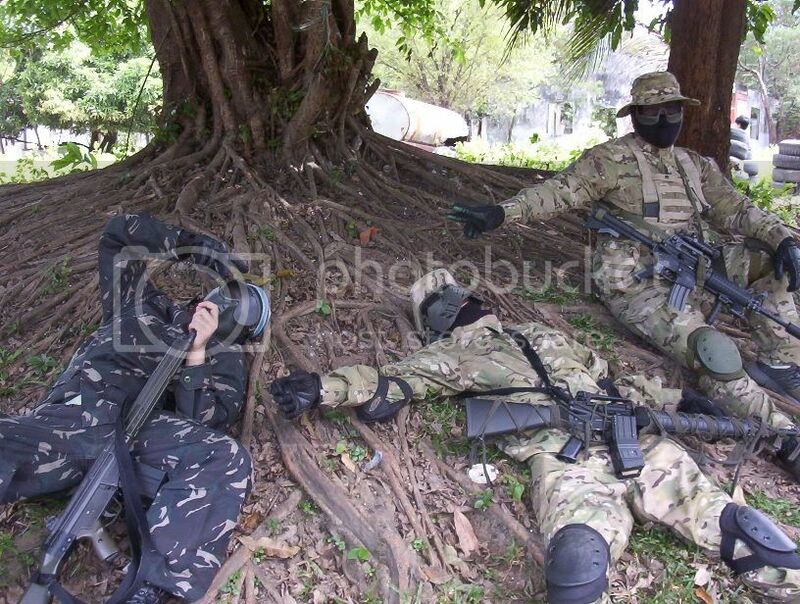 lam ko marami din dyan naglalaro ng airsoft e. im not sure where exactly though. private anonymous: hindi na yata mandatory ang CAT ngayon e. may community service na kasi yata. officer ako nung highschool sa CAT and yep, there's no more satisfying thing than seeing them scamper under hails of dakka! private pobs: paintball's cool too. 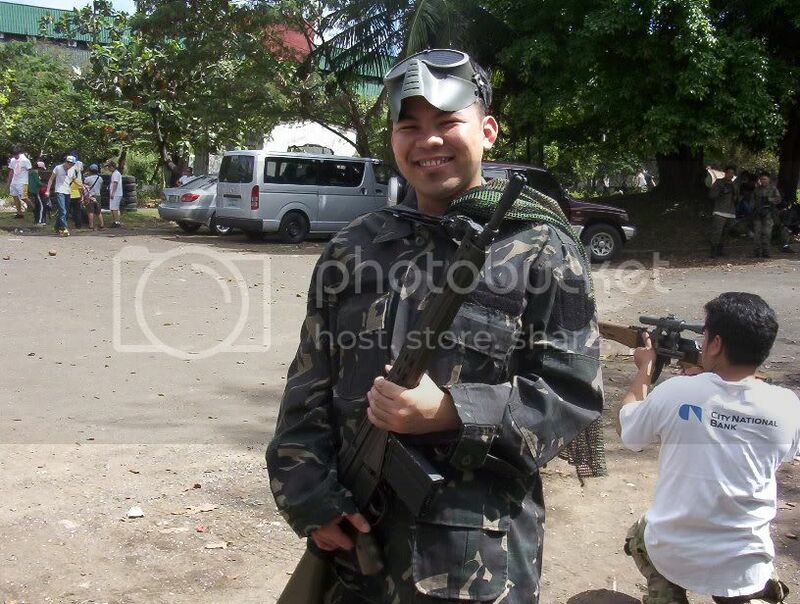 iL favor airsoft though for a more satisfying adrenaline-rush. =) but yeah, both were tiring nonetheless. wow mukang sobrang nag enjoy kayo ah! kumander romy: kesa mag drugs. nyahehehe. corporal tin: sir, that's an understatement, sir! nyahehehehe.